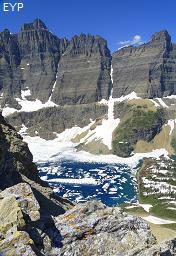 Iceberg Lake, Glacier National Park. 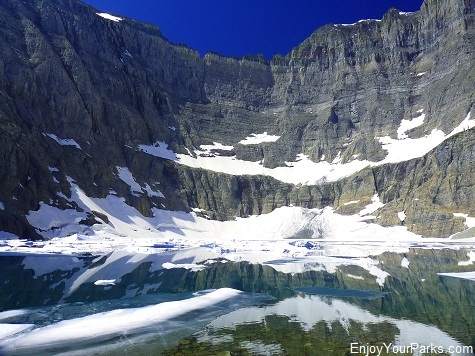 Iceberg Lake is another iconic sight-seeing attraction in Glacier National Park. 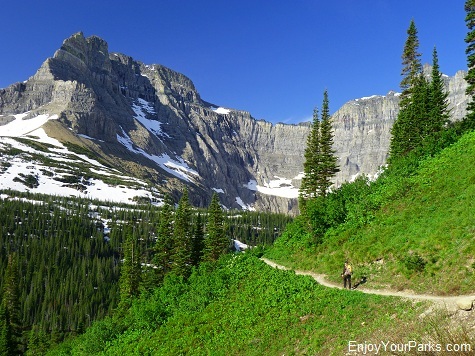 It's pure enjoyment! 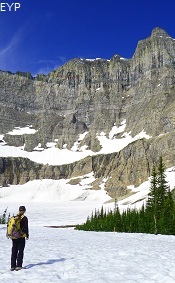 The views all along the Iceberg Lake Trail are spectacular! 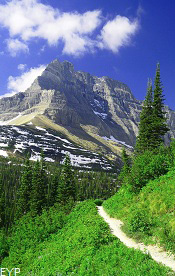 And even though you climb a total of 1200 vertical feet, you won't even notice it because the climb is so gradual. 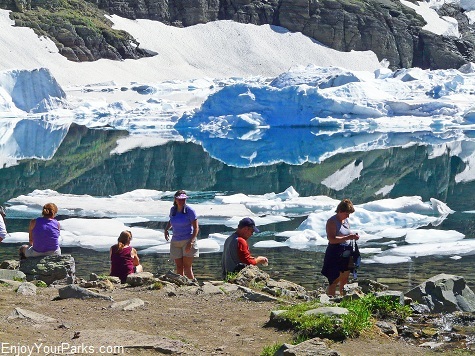 Iceberg Lake is located in the Many Glacier Area, and it's a "must see" for visitors who love a gorgeous hike in Glacier National Park! 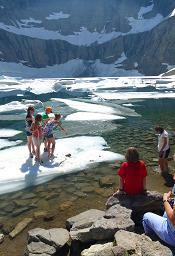 The above photo of Iceberg Lake was taken in late July, and as you can see there are still plenty of icebergs. 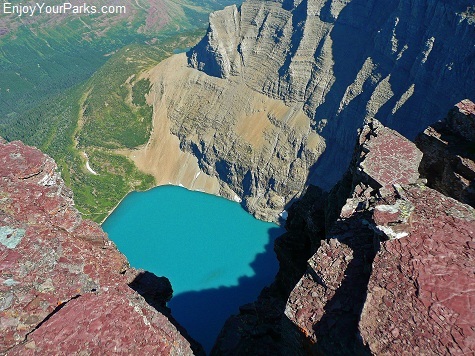 The reason why this lake has so many icebergs is the fact that it is surrounded by 3,000 foot cliffs, and direct sunlight does not touch Iceberg Lake in the winter. 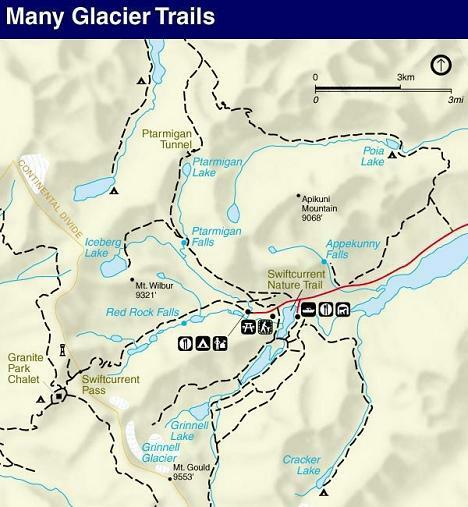 This results in a tremendous amount of snow and ice accumulated each winter here, and it takes months for all of that snow and ice to melt each summer. 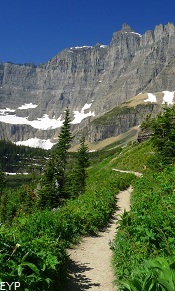 The view all along the Iceberg Lake Trail in Glacier National Park is absolutely gorgeous! 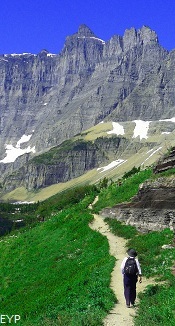 This trail is one of the premiere highlights in the Many Glacier Area. 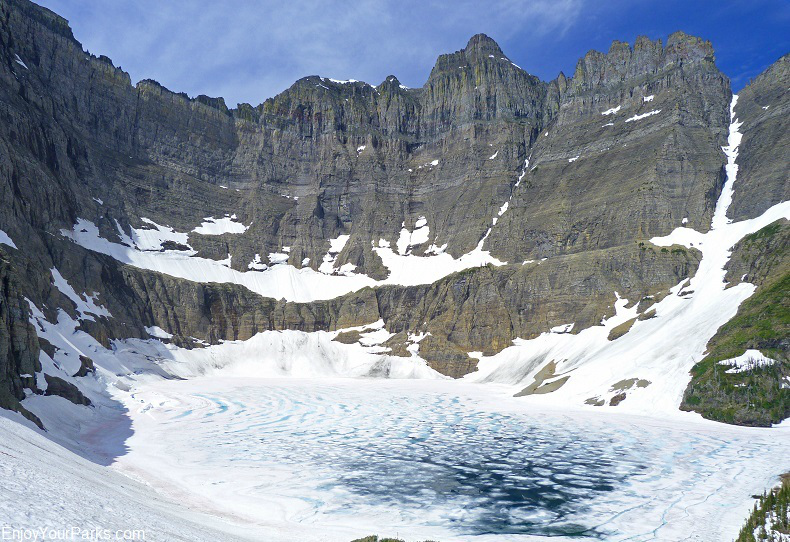 Glacier National Park's Iceberg Lake is nestled in a deep cirque (bowl) and is surrounded by huge walls up to three thousand feet tall. 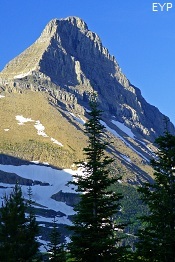 The angle of the sunlight in the morning is best for photographing these walls. 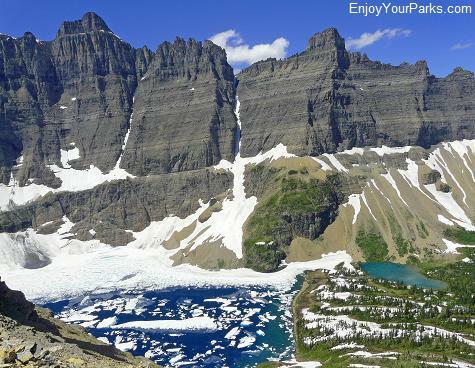 Later in the day these walls are in shadows. 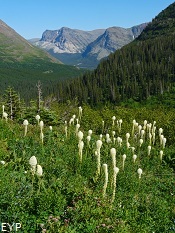 The scenery along the entire Iceberg Lake Trail is remarkable. 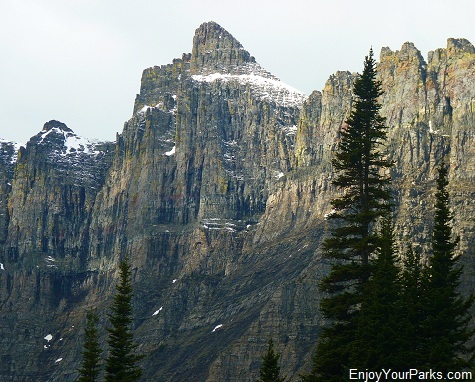 You'll see towering peaks such as Mount Wilbur, Iceberg Peak, the Pinnacle Wall, Mount Henkel, Grinnell Mountain and many others. 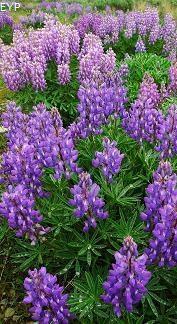 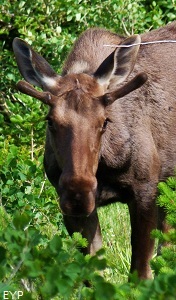 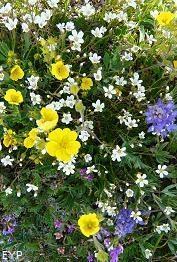 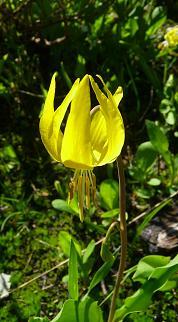 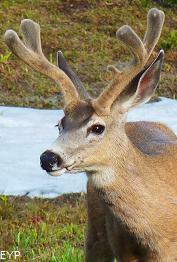 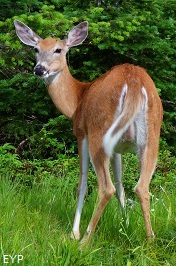 You'll also see many wild flowers during certain times of the summer, and a huge assortment of wildlife. 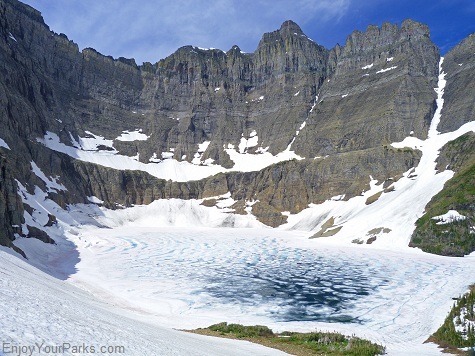 Iceberg Lake in Glacier Park is surrounded by huge breath-taking walls. 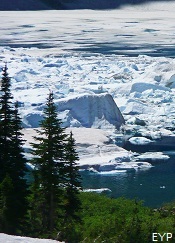 If you're too early in the season you won't see any icebergs because the lake will still be frozen. 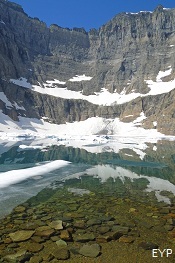 It's quite deceiving though because quite often the ice will clear off the water near the shoreline where the Iceberg Lake Trail meets the lake, and it will appear that there is no ice or icebergs at all. 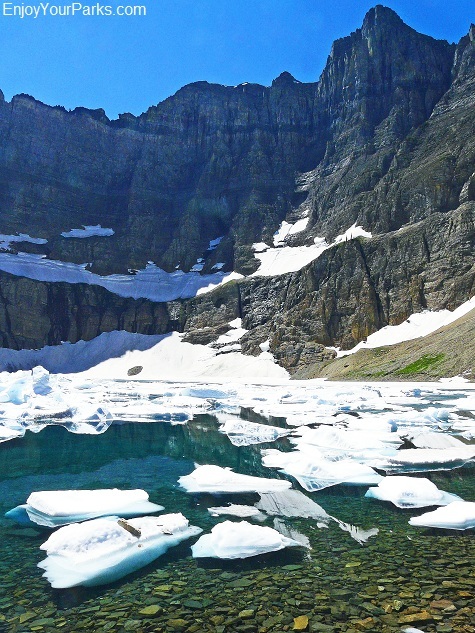 But in fact, two-thirds of the lake is still covered in solid ice that hasn't broken up yet. 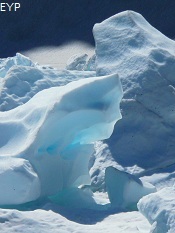 On top of this ice is also a huge amount of snow. 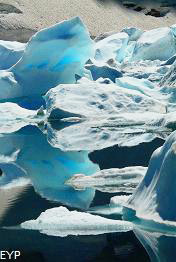 As the season progresses, this massive ice layer and snow layer that rests closer to the cliffs will begin to break up, thus causing the lake to fill up with icebergs and "snowbergs". 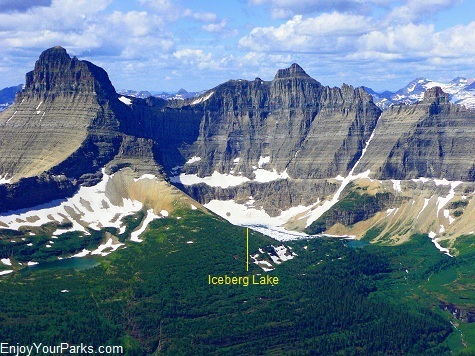 By mid July Iceberg Lake is usually full of icebergs and slowly but surely they begin to melt away throughout the remaining Glacier Park summer days. 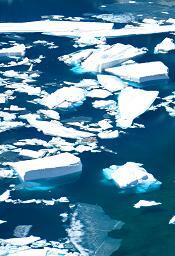 Usually by mid August the icebergs are gone. 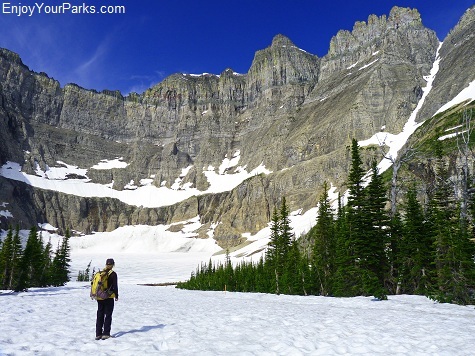 HOWEVER the hike along the Iceberg Lake Trail is still absolutely gorgeous no matter what time of the season, and Iceberg Lake is a beautiful bluish-green color. 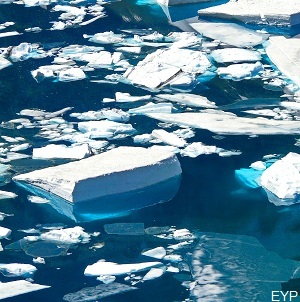 It's so pretty it doesn't need icebergs! 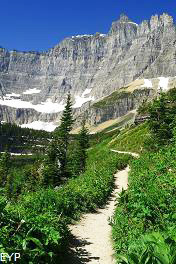 The Iceberg Lake Trail is always worth the hike no matter when you're visiting Glacier National Park. 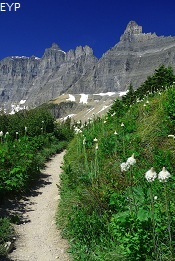 THE ICEBERG LAKE TRAIL IS A VERY GRADUAL CLIMB. 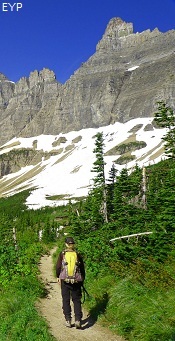 The steepest part of the Iceberg Lake Trail is the first half mile, so don't get psyched out. 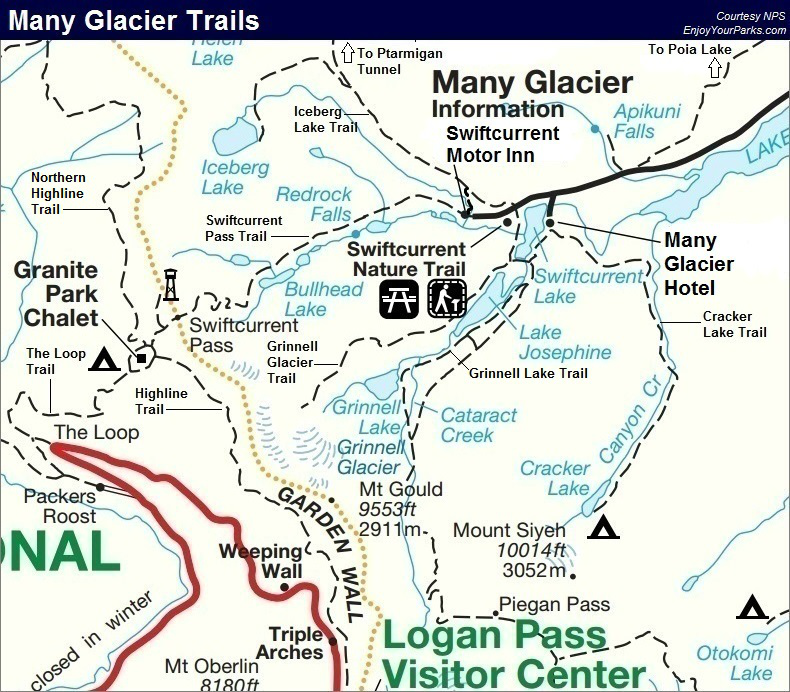 After the first half mile or so, it levels off and the remainder of the hike is very pleasant. 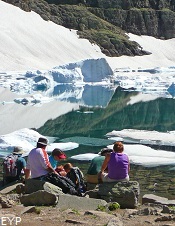 For information on what to bring and wear on your hike to Iceberg Lake and any other hikes you're interested in, check out our Informative E-Books. 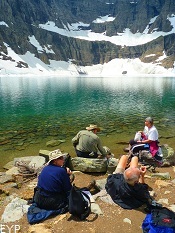 The shore of Iceberg Lake is a great place to have lunch! 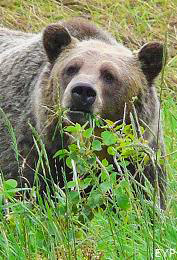 Bring pepper spray, and talk loud to let the bears know you are in the area, so they can avoid you. 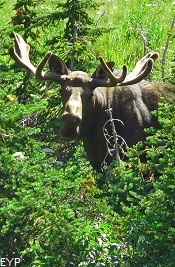 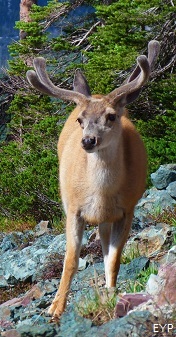 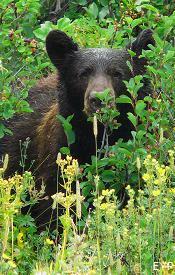 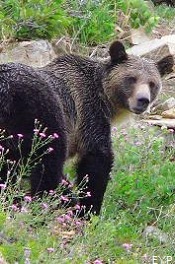 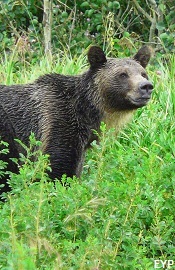 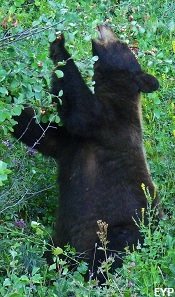 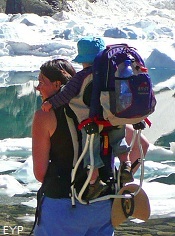 Both grizzlies and black bears frequent the Iceberg Lake Trail. 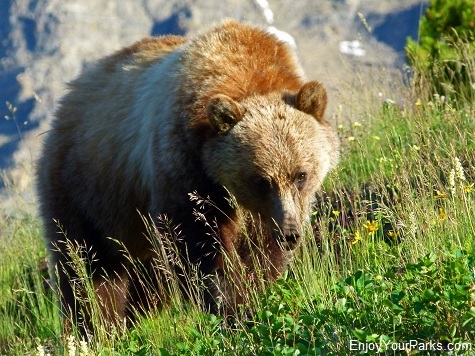 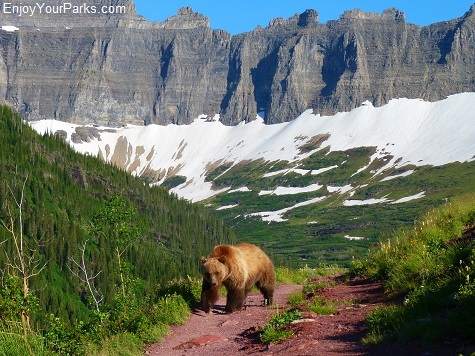 There are definitely grizzly bears along the Iceberg Lake Trail, so be sure to talk loud so they know you're coming and can have time to avoid you. 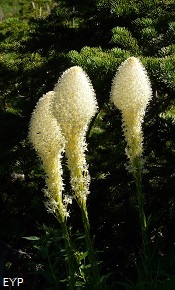 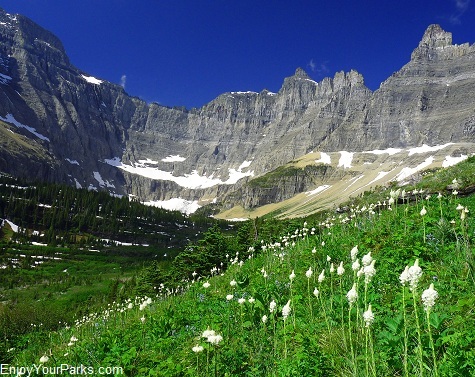 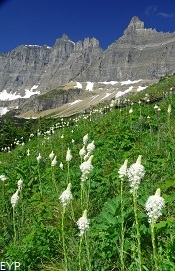 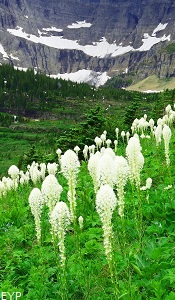 If you hit it right, the beargrass along the Iceberg Lake Trail is legendary. 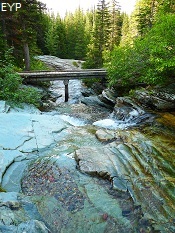 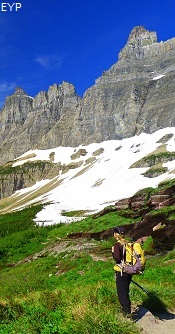 The Iceberg Lake Trail is one of the most popular hikes in Glacier National Park. 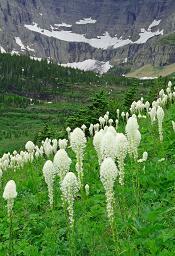 There is always plenty of snow at Iceberg Lake early in the season. 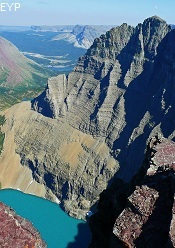 This is a view of Iceberg Lake from Crowfeet Mountain. 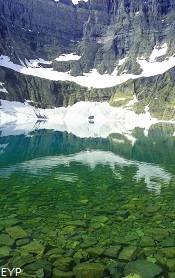 The lake is covered in ice. 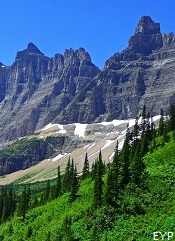 The lake to the left is called Shangri La. 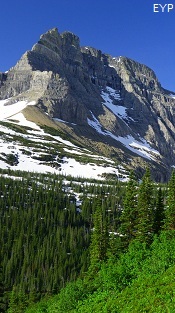 The peak to the left is Mount Wilbur, and to the right of Mt. 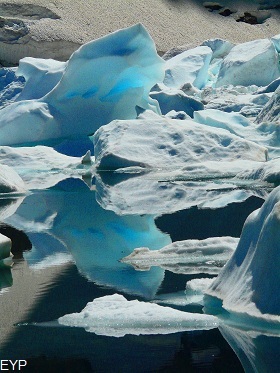 Wilbur is Iceberg Peak. 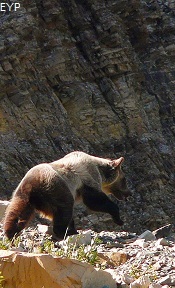 This grizzly was actually walking ON the Iceberg Lake Trail! 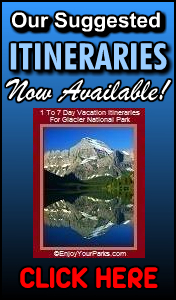 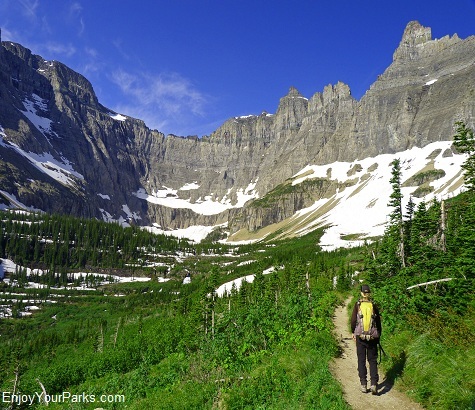 You will definitely enjoy your hike to Iceberg Lake in Glacier National Park!